Our friend guliolopez (who always seems to miss the Cork related photos) will know the answer to the following question, are the Musgrave Brothers we see here the same Musgraves which established Centra and Supervalu the biggest retail operators in Ireland? Street View 2017 The Hotel opened in 1897 (www.themetropolehotel.ie/our-story.html) and was was largely rebuilt and extended during 1910-11 after a large fire (archiseek.com/2012/1900-hotel-metropole-cork/). This photo was thus taken between 1897 and 1910. [https://www.flickr.com/photos/[email protected]] An interesting read, so the Musgraves owned the Hotel! Electric tramway (see tracks and wires and poles) started in 1898 - en.wikipedia.org/wiki/Cork_Electric_Tramways_and_Lighting... "Services started on 22 December 1898 when the company had 17 cars in operation. Over the Christmas period, weekend traffic was heavy and there were some minor accidents and injuries, including some passengers who, having been celebrating Christmas, fell from the tramcars. ..."
Are SM and TM, on the date blocks, the initials of the Musgrave bros. Update, yes it is, Thomas and Stuart Musgrave. The landmark Metropole Hotel in Cork, which was, until the mid 1950s, known as Ireland’s finest “dry hotel”, is now the spiritual home of the Cork Jazz Festival and is considering further expansion. Examiner The Met was opened in 1897 and was owned by the Musgraves. 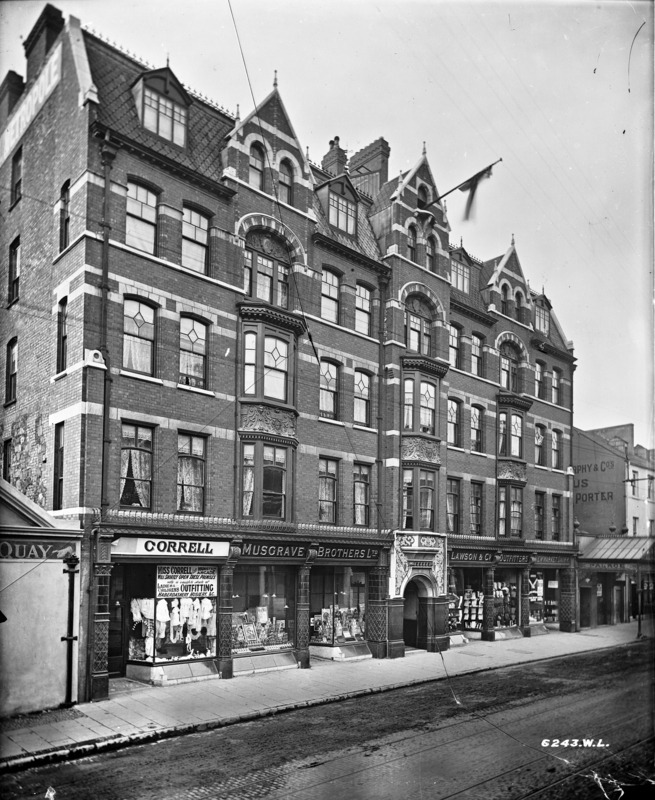 The property on MacCurtain Street was designed by architect Arthur Hill and built by John Delaney & Co Builders to the highest standards and opulence of the day, with most of its early guests being travelling salesmen and businessmen. The hotel occupied the upper floors of the building with the ground floor and basement let out for retail, with two shops on either side of the main entrance - including the famous Turkish Delight sweet shop, ‘Hadji Bey’, run by Harutan Batmazian who had arrived in Cork from Armenia in 1903 and who had his own sweet stall at the Great Exhibition in Cork. Lawson’s Outfitters occupied another unit and the name can still be seen over the shop door today. Edward VII is reputed to have had tea on the roof of the Metropole when he visited Cork in 1903 for the city’s Great Exhibition, and other famous guests included Gregory Peck, James Mason, Frank O’Connor, John Steinbeck, John Huston and Walt Disney. In 1977 the Metropole was sold to a consortium of local businessmen and a leisure centre was added. In 1999 it was sold on to Ryan Hotels and it underwent a €9m refurbishment. The hotel has been under new ownership since 2015 — a London-based family who also own the Cork International and Cork Airport Hotels — and following the purchase of an adjoining site, another upgrade and extension is being considered. Funnily enough, the Metropole was "in the news" yesterday. For some unexpected guests in the dining room. Perhaps they were following this thread - and decided to go have a look?